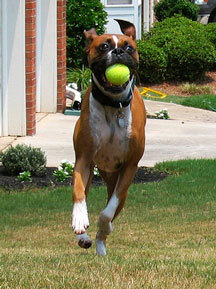 One thing to know about the Boxer breed is that they have boundless energy! The kind of energy that could power a household if you could devise a way to hook up their energy level to a generator! So it’s very important when considering a Boxer that you are aware of the time commitment that is required to have a happy healthy balanced dog  and to keep the sanity of you, the owner, intact. Opening the door to a backyard and letting your dog go out to the bathroom isn’t exercise, nor is leaving the dog in the yard to entertain himself. It doesn’t matter if your yard is two acres, to the dog, it’s just one big kennel with walls. Plus, a dog sitting in the backyard by himself is not providing your dog with any mental or physical stimulation and that can result in some unwanted bad behavior  new landscaping in the shape of enormous gopher like holes, non-stop barking, or the digging up of all the new flowers you just planted. Left to their own devices, a bored Boxer can become a bad Boxer, not through any fault of his own, but because you, the owner, have not provided structured exercise in the form of walking. Be responsible when exercising your Boxer. Note that these dogs do not do well in extreme weather conditions  the mid-day heat of the afternoon is not the most ideal walking time for your Boxer who has a short muzzle (brachiocephalic facial structure) and by the same token, extreme cold is also not good for the short-haired Boxer. Choose your time wisely when you walk, first thing in the morning before the heat and humidity have had a chance to take over the day, and night time when the heat of the sun is diminishing are ideal for your dog. Make sure you carry some water for your companion. Too many times people will take water for themselves and don’t think that their four-legged friend wearing a fur jacket would also like some water during their walk. Try to aim for a good 45-60 minutes a day walk with your Boxer - twice a day is even better. This is a great time to bond with your dog. 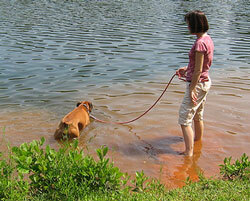 Care must also be taken not to over-exercise young dogs, as this may damage growing bones. Strenuous exercise or activities should not be done right before or after he eats. Boxers are susceptible to bloat, which can kill. Boxers enjoy, and do well in canine sports such as agility, frisbee, and tracking so don’t forget to challenge your dog in other exercise arenas. Above all, remember that exercise is very important to the well being of you and your Boxer  so lace up those shoes and hit the pavement!